Warm Greetings from the Den! - Fr. Peter-Hans Kolvenbach, S.J. We warmly welcome you to our website! Our website remains a veritable source of information about Loyola Jesuit College. We invite you, therefore, to search for information available on our site about the Den (the home of lions and lionesses, our mascot! ), the pride (young lions and lionesses!) and the college. However, we are currently upgrading our site; we, therefore beg your indulgence, as we work on it. After twenty-one years of excellent holistic education, Loyola Jesuit College remains a model college for Nigerian Primary and Secondary Schools. As a model college, Loyola Jesuit College continues to employ Ignatian Pedagogical Paradigm(I.P.P.) and Ignatian values including a search for excellence, critical reasoning, focused rigor, creative imagination, critical awareness and cura personalis in the formation of its students, staff, and parents. The college continues to produce well-formed critical thinkers and future leaders who make a mark of excellence in learning, in character, in spiritual development and in service to humanity. Our alumni continue to distinguish themselves in these areas in the top institutions where they study and work. Rev. Fr. 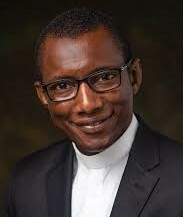 Peter Chidolue, S.J.